In 1587, over 100 colonists, desperate for a better life in the new world, disappear without a trace from a settlement on tiny Roanoke Island, just off the coast of North Carolina. To Helen Weils, best-selling author and respected academic, history is a realm of observable facts, each one carefully weighed and inspected. So when she encounters Chip Sledd, a conspiracy theorist who insists there's an unimaginable connection between the disappearance of the colonists in 1587 and the strange noises in the sky, she's quick to dismiss his theories as the irrational ramblings of a lunatic. But when black-suited agents begin pursuing her and Chip, Helen soon realizes that the past is a lot more flexible than she ever thought possible - and seeking the truth sometimes means accepting the strangest theory of them all. In this riveting time travel techno thriller, USA Today best-selling author Ernie Lindsey takes listeners on a captivating journey throughout history. With a blend of mystery, suspense, psychological drama, and fast-paced action adventure, Skynoise promises, and delivers. Did you hear something ?? Most highly. Very entertaining time travel/ historical thriller with a bit of romance thrown in. Clearly well researched and done with panache and style. Entertaining is the best reason to listen. Our male hero, without a doubt. Courage and guile make his character complete. She does in many ways. Clearly activates the many characters, and does so with a light dexterious touch. Not much of a movie buff these days, but maybe " Voices from the past"
My only major beef with this offering is the wimpy aspects of the female lead character. Whiny and not the sharpest knife in the drawer at time, which was mildly annoying. That said, this is a fine offering, and I highly recommend it. I was not sure what to expect coming into this book. I heard it was a time travel book, but also a romance? As it turns out it isn’t really either of those things. It is a modern sci-fi that keeps you guessing all the way to the end. Helen is the main character in this rambunctious read. She is in charge of the narrative the whole time. You only know what she knows and things unfold for you as they do for her. Lots of things to suss out along the way. Chip seems like a nut, most of the time, but there is a grain of truth in every conspiracy. He runs you on a merry chase, what with his lies and misdirections. There are time travel elements, that play out with the story, but I don’t want to give that away. Suffice to say, it is a really fascinating twist on the whole theme. I loved Helen’s sarcastic wit and constantly questioning things. She is a great character, which makes the book engaging. Having such a strong female lead, she needed a foil, enter Chip. He is dopey and cute, which makes him totally endearing! In a way they make a balanced couple. In the end, they are very well matched. Again, trying to preserve the plot and stay spoiler free. I listened to the audiobook narrated by Rebecca Roberts, who is a new voice for my ears. I loved her read and the energy she infuses into the story. Her tone fits the sarcastic lead to a tee. I love a swift pace, she definitely delivers. Her energy adds to the story in all the best ways. I am going to have to look for more of her reads, because she gave me very happy ears! Overall, this was a great read with many twists and turns. The only disappointment I had, was it was only about the Roanoke mystery in a roundabout way. I came into it expecting a book all about that mystery, as I have a little history nerd in me who is fascinated by the mystery of it all. I can forgive the change of topic, as it was a fascinating story from beginning to end. Sky Noise... a well-written book about time travel. Chip has been stalking Helen Weils for quite some time. Helen always considered Chip was nuts, but always let him down easy. One day Chip corners Helen and makes her listen to him and suddenly she is in danger. Whether she wants to be or not, Helen is now involved in this sci-fi / adventure / romance / fantasy world of time travel thanks to Chip. Now Chips enemies are her enemies too or at least the enemies believe she is. Travel along with Chip and Helen as they risk their lives jumping thru history to re-write some of the wrongs in our past and every time they make a jump, it is recorded in our history books as a sky noise! The author, Ernie Lindsey did a great job writing this book. The plot is excellent and loaded with lots of twists and turns. It is very fast paced, so pay attention or you will get lost. The narrator, Rebecca Roberts did a fantastic job delivering this story to us with all her multiple voices and only added to the thrill of the story with all her excitement! Well developed characters, funny and fast paced plot. A must listen for an enjoyable drive to and from work. It beats road rage every time. Great narration by Rebecca Roberts. Interesting story with conspiracy theories, time travel, chases, more. If you like time travel stories and good sci-fi then this book will please you ...until the last 2 to 3 chapters. I loved this book but have never been so so disappointed in a confusing and lost ending ever ! If I had it to do again I would of passed as the rotten ending ruined the rest of the book for me . I'm a sucker for time travel stories, so I had to pick it up...and maybe my time would've been spent elsewhere. The story itself seemed rather simple. The book had a couple of very interesting concepts (spoilers), but the characters and dialog seemed a bit unbelievable. I would. I probably already have. She sounded very familiar. She did a great job with the narration. Was Skynoise worth the listening time? I wasn't wow'd by it but it wasn't bad. There were some interesting bits in it about time travel but as far the time traveling itself, it was lacking. The main character spent most of his time trying to convince the female lead that everything was true or real. After a while it got frustrating when she would dismiss something even though she clearly saw it or experienced it. Enjoyed this book- fun whitty and well read. Roberts has a soft deep and rumbling voice- love it she doesnot shock or startle yet conveys the message effectively. Plan to look for more Roberts Read. What made the experience of listening to Skynoise the most enjoyable? Rebecca Roberts is quite a good narrator! Skynoise is a fast fun read,though I listened to it! Rebecca Roberts is a wonderful narrator and brings it all to life.As long as you remember that this is fiction,you will enjoy this time travel,full of intrigue,rollercoaster of a novel! "I was provided this audiobook at no charge by the author in exchange for an unbiased review via AudiobookBlast dot com." There's not much I can say about this book that hasn't already been said, it's a great time travel story. 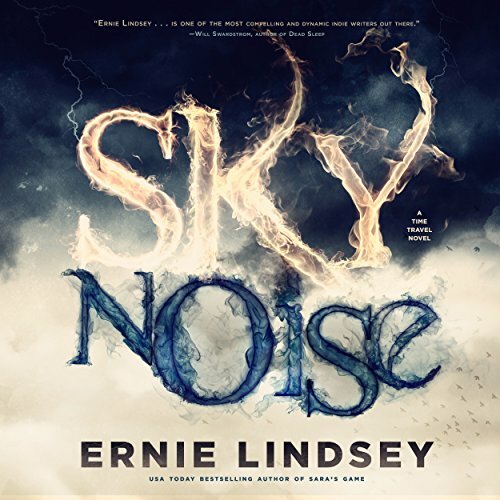 I can add this though: What made this book especially interesting for me is the knowledge that the Roanoke Colony disappearance and sky noises are actual unsolved mysteries and I loved that Ernie Lindsey incorporated real life mysteries into his book, it was very clever. It made the book that much more engaging for me. Rebecca Roberts also did a fantastic job at narrating and giving life to all the characters.